Disclaimer: Before reading you ought to know that I thought the wedding was the stupidest display of pomp EV-ER. That being said, it sucked me right in and I watched it at 3am totally fascinated with the ridiculous prestige of it all. The Brits would say I'm an uncultured American. I say they have pointless and ridiculous pomp. Touche'. I actually wish Will and Kate well. You should probably be told that before you read my following thoughts (they aren't very respectful). As follows, here are my irreverent thoughts about the wedding as I watched it unfold. You will soon notice I have absolutely no respect for British nobility though I found it fascinatingly riveting. Obviously, I'm American. My ancestors came over on some of the first boats to get away from them. So while some great-great-great of mine was a lady-in-waiting to Queen Elizabeth, I'm too far removed to give a hoot. -At least Kate didn't pick a tacky dress. Though when I first saw it in the car, I thought, "Ew, lace down the arms??" When she got out I was happy to see it was actually tasteful. I actually loved it. -Lace collars on the choir boys? Really. Poor kids. And it looked hard to breathe while singing. -While all the royals were dripping with medals, how many do think were actually EARNED? I'm gunna go with a grand total of possibly zero. 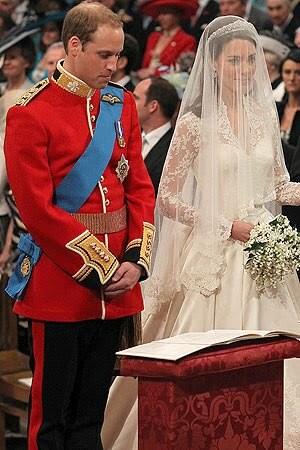 -William and Kate seemed afraid to show any sort of affection in such formality, but Will tried at times. When their hands were not supposed to be together they quickly dropped them down and clasped them quickly and decorously to their front. You know when people get married, they are usually not prepping for a lifetime of not touching each other. It's kinda the opposite actually. What formal decorum. -Check out the cousin's hats! Eugenia's pink wackadoodle thing behind the queen took the cake! What the heck was she THINKING! I heard someone say she was channeling Lady GaGa. She was certainly channeling but I say more like wicked stepsister. -All the royals aren't that good looking. The commoners they marry look a lot better. They are kind of a nerdy, goofy looking family. I say the commoners are good for the blood lines. -Will looks a lot like his mother though he manages to channel the goofiness of his father. The Brits are a bit biased when they kept saying "he's so dashing and good-looking." I'm gunna say they were dazzled by the uniform and unearned medals. -I was in love with the sister, Pippa's, sheath dress. I thought that was magical. -How much of that Christianity, prayer, and scripture is all just ritual? How much is real? How much is actually LIVED? Uh huh. Case made. -The way her brother James read the passage from Romans was so dramatic it was almost silly. Great passage, but he made me want to laugh. -And by the way, his tie was bunched up the whole time. -The little flower girl walked in with her mouth wide open and looked petrified. She wasn't too keen with the noisiness on the balcony either. Funny. -How does one go about meeting and dating a prince in the first place? Oh yeah. Rich dad sends you to rich boarding school. They said about her dad, "He looks proud. Not bad for a Yorkshire born son of an airline pilot." OH. Now it's clear to me. I'm going with it's probably those pilot genes working in her favor. -Some Latin hymn that was sung was quoted to be "a particular favorite of the couple." Really? They listen to that stuff? Regularly? Hmmm. Don't mind me if I remain slightly suspicious. -Prince Harry had a refreshing swagger. He was the only one not quite so formal and walking in a perfect line. Good for him. Good for him. You rebel you, off two steps to the side. -Because the groom is supposed to be the last to see the bride, he had to have his back to her the whole four minute walk down the aisle. Well, blast! That pretty much ruined the wedding for me since that's always the best part! -A pan of the aisles showed several wheelchairs. No wonder the royals are excited about a young wedding. I doubt the crazy cousins with the crazy hats are getting married anytime soon. Any takers? -The Queen sits closest to the aisle, not Prince Charles. Clearly, we know who rules the roost here. She should have been booted over, Queen or no. Maybe let Dad be first today, huh? -Lots of pompous praying. How do they know when to automatically respond with an "amen"? -I wish it wasn't too formal for a wedding ceremony kiss. -And really? Thousands wait for that little peck on the balcony? Really Brits! It's too easy to get you excited. Oh wait. That was two pecks. Oh clearly NOW I see. -An inner private sanctuary from the middle ages in the church where they go to sign the certificates? Gee, I'm glad God actually abolished such a real thing at the cross. Leave it to us pompous Christians to bring it back. -Most people seemed to barely know the hymns (though they were said to be popular). Elton John barely sang them. Heck, I even knew the first hymn better! But by golly, they all belted out "God Save the Queen". Quite a fervent following for a doddering old lady who just happened to be born lucky. Whatev. Oh right. She's next best to God himself. See, I'm not British so I didn't understand. -Did anyone else want to burst out laughing on the looks on the men's faces in the choir while they were singing? Their "singing faces" were HI-LAR-I-OUS! -So...why didn't Will get a ring too? I realize the world will know he's married so it's kind of a mute point, but still...I think he should have one too. There are other reasons to wear rings (besides the obvious one: showing other women your man is married). -I was loving the top hats on the men. Oh, and those dashing morning suits. -What's with the flower girls being called "maids of honor"? Why didn't Kate have any attendants besides her sister? -Catherine Elizabeth Middleton? Can you get a more English name than that? I'm going to go out on a limb here and say their kids are going to have pretty traditional names. Just a guess. So there you go. I told you there was a big disclaimer first. I admit I watched this wedding with a lot of disdain for the pomp for the people, that as far as I can tell, did absolutely nothing but be born lucky. Lucky them. Lucky me....it entertained me greatly for most of today. Oh and then Tone called from work, and while at first he thought the whole thing was SO dumb, I sucked him in, and despite himself, we discussed the whole British family and royal life for over an hour. So thank you Brits, for that stimulating discussion with my husband too. Here is my next item on my bucket list: Get invited to a British wedding just to have a reason to wear one of those ridiculous hats. I know I could rock it. Just sayin. Hahahahahahaha! You made my day. I totally agree. They seemed SOOOOO uncomfortable yesterday and I just hated that they couldn't touch each other at all. Awkward. I know I was nervous at my wedding, but never worried about screwing anything up. And yes, you could totally rock one of those hats! This cracked me up! Thanks for the great laugh.